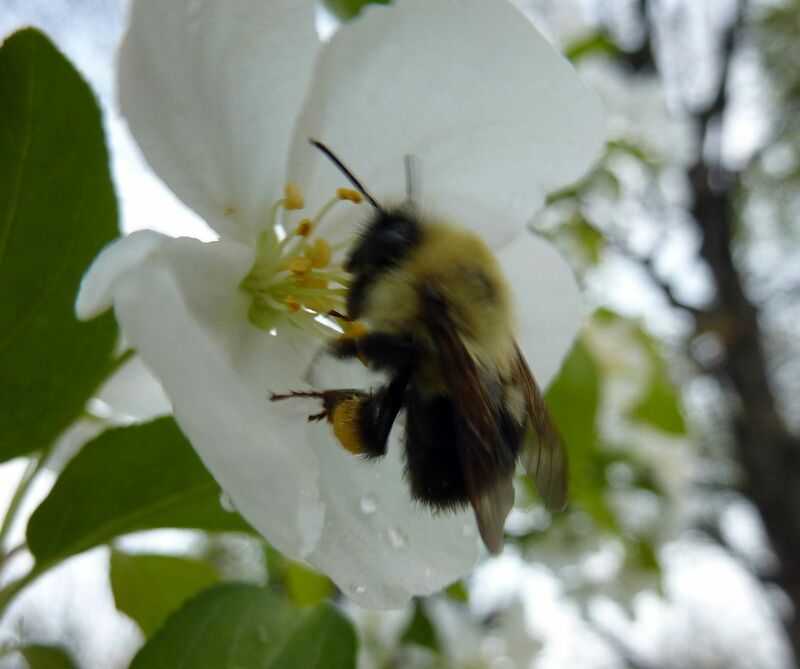 My friend tells me this is a worker bumblebee, most likely Bombus bimaculatus. This warm year seems to have sped up their cycle somewhat so it's a little early to see workers flying about in April. Even so, this is one of the shorter lived species, with hives normally petering out in July. They make their reproductives and the colony soon falls apart for the year leaving loan males and young queens out in the wild waiting until the end of summer, all of autumn and most of winter to pass before starting a hive of the own. I'd be curious to know if this year's hives grow larger than usual or perhaps makes reproductives sooner than normal. 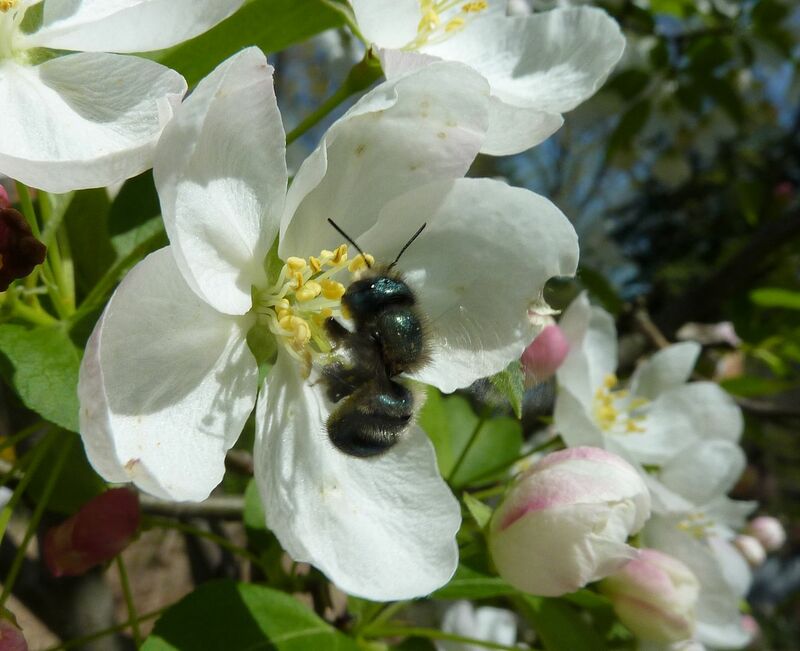 Osmia lignaria, The Blue Orchard Mason Bee, is one of the few bees I can identify on my own. I believe the reason might be because it's somewhat unique looking. This is a type of Mason bee which lives in preexisting, tube shaped, cavities that only have one entrance. That sounds like a long list of requirements but the structure occurs naturally in nature all the time: wood boring beetle grubs emerging from a tree, or last year's hollow stemmed herbaceous perennials for example. This Andrena sp. 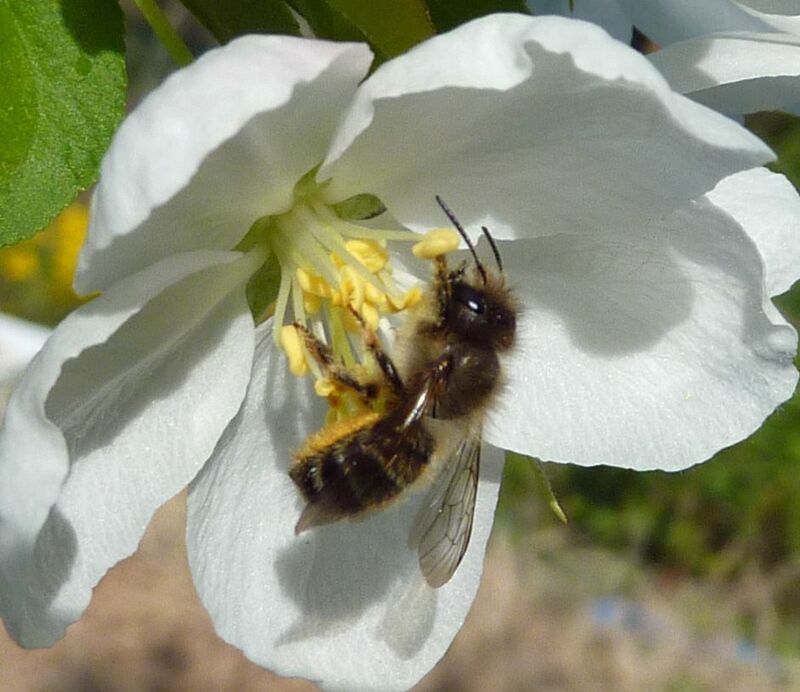 is a type of mining or digger bee. Both common names work as they nest underground no matter what you call them. 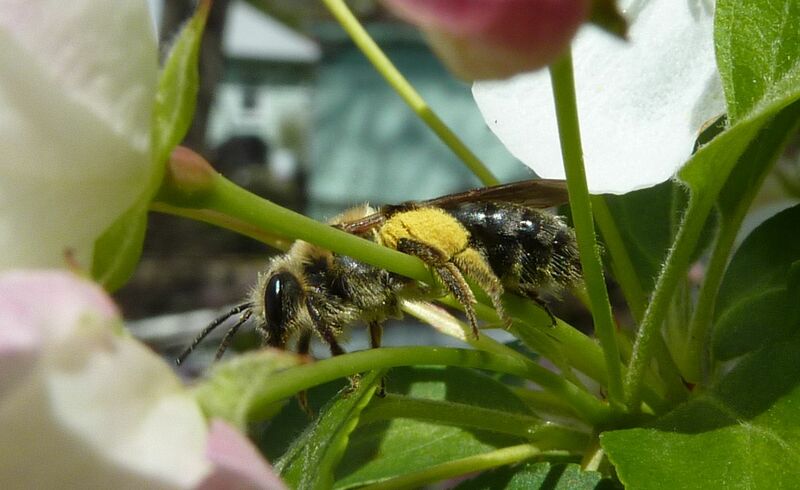 Unlike Mason bees they collect pollen on their legs, while Masons store it under the abdomen. I'm not sure why this is though perhaps it has something to do with digging requires thick sturdy legs with hairs to aid in moving the soil. These same hairs likely double as pollen collectors. Osmia taurus, an introduced species that's displacing some of our natives. 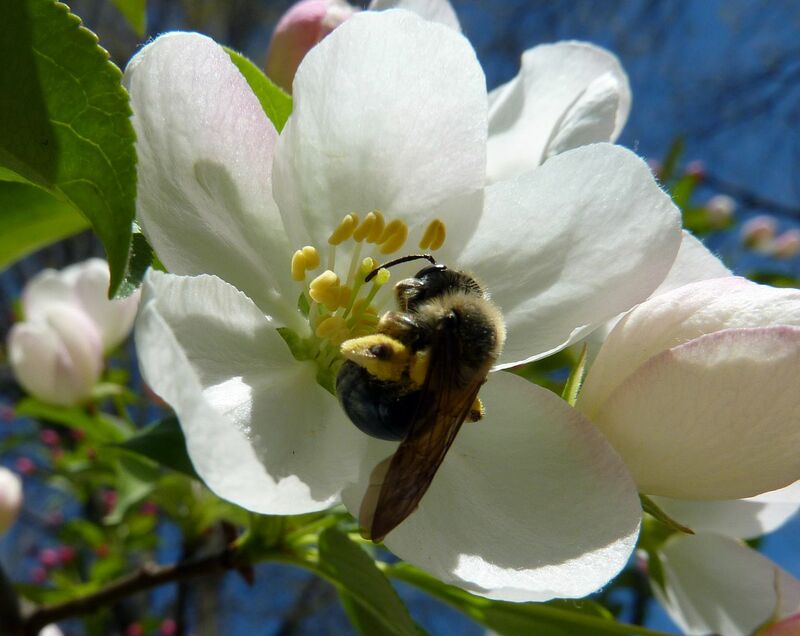 Because of this and other introduced mason bees, most experts seem to be on the fence about recommending Mason Bee Tubes (such as those sold by Knox Cellars Native Pollinators). The idea being such sites would allow the nonnatives to gain access to other locations they haven't reached. At the same time though they provide nesting for natives as well. Unfortunately this is a topic that needs more study. O. taurus is abundant in my area but I still have native species, and presumably 2 other species nesting alongside them. A major reason to discourage nonnative bees is they sometimes specialize in pollinating noxious weeds. The Giant Resin Bee, Megachile sculpturalis, is an introduced species from Asia. It's basically an overgrown leaf cutter bee that goes right for plant resin instead of cutting leaves. It's also a more suited pollinator of the dreaded Kudzu, Pueraria montana. Kudzu used to rarely produce seeds as very few of our native pollinators were managing to pollinate the flowers, though I'm sure many were able to steal nectar from it. As things leaf out we'll start to see real leaf cutter bees flying around. These nest in both underground holes and in preexisting tubes. They're set apart from digger and mason bees in that they cut slices out of leaves to make chambers, instead of using mud or simply burying their young. Over the summer I'll also be keeping an eye out for Squash Bees, Sunflower Bees, and Rose Mallow Bees. Also buzzing about now should be Blueberry Bees; all of whom specialize in flower shapes that their common names suggest.